Another advantage of this tool is that users will have their words always at hand, in their smartphones, tablets or pcs (through any web browser). The pedagogical approach proposed by this app is the same as in traditional vocabulary notebooks (paper notebooks), emphasizing in the personalization of the learning process. We can make notes about the new words we learn, writing definitions, sample sentences, translations… We can also group them in our own categories and make personal notes about them. The main advantage of Vocabulary Notebook is that it solves paper-related problems, such as space & edition issues, limited number of pages, difficulties sorting words alphabetically or reviewing the vocabulary by categories, etc. Moreover, it also provides other advantages of the technology, including pronunciation of the words, easy editions at any moment without crossing out; unlimited storage… And students don’t have to carry heavy and uncomfortable notebooks. One of the more interesting features is the ability to group words by topics that are also created by the student. This feature allow them to filter the list while studying, being able to review only the words they want, such as the not-known words, the words within the category “project management” or the important words in the category “methodologies”. Web application: Teacher, detect the problems of your students and organize your classes! 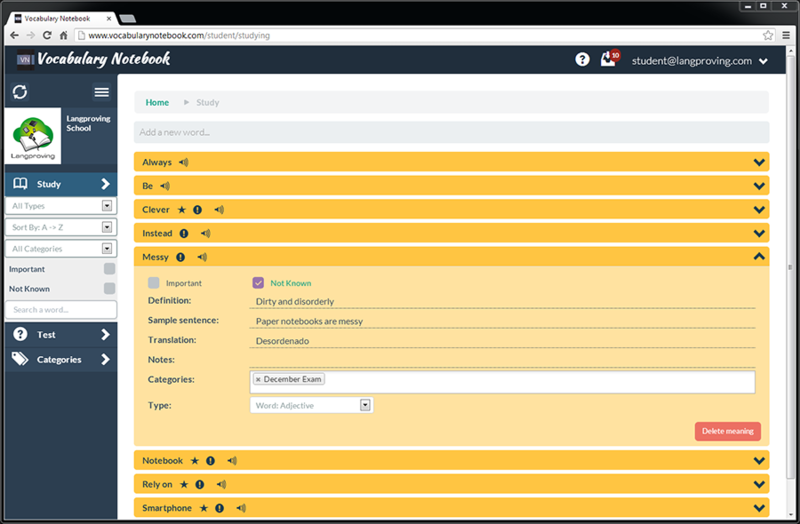 As part of the Vocabulary Notebook platform there is also a web application both for students and teachers. With the Full Platform students can have a cloud account, thus having all the words stored in external servers, having all their devices synchronized. With this accounts they are able to use not only their smartphones and tablets but also the web application, having their words available anywhere at any time. Through the web application the students can also add, review and modify their personal vocabulary. Moreover, students can apply advanced filters (sorting from A to Z, Z to A, by last modified or by creation date) and edit words easily. Self-assessment tests are also available from the web application. Moreover, with the full platform from schools, students will receive teacher’s suggestions through the web application (in the inbox next to the email in the top-right corner). As the tool focus on the personalization of the learning process students can either accept or decline the suggested words. In case they accept the word, all the fields (definition, sample sentence, translation, categories…) will be empty. The student is encouraged to fill them with his/her own words. As mentioned above, the web application also includes special tools for teachers. This features allow them organize their classes better and help their students learn vocabulary faster. Among other features, the teacher account includes sending lists of words to students (by levels) or displaying on a dashboard a lot of information about the usage their students do of their digital Vocabulary Notebooks. Teachers can see the words their students mark as “not known” in order to know the words that must be reviewed in class; they can also see the words that students consider important or the topics they use the most, which shows their interests and allows teachers to guide their classes to those topics. Regarding the stats, teachers can see general stats that include the number of words each student has, the number of logins they do, the number of self assessment tests each student has done and their average scores in the tests. On the other hand, when a teacher has sent a list of suggested words to a group of students, stats about the suggestions are also displayed. This stats include the number of words from the suggestion that each student accepted, the number of words each student declined and the number of words from the suggestion that each student already had in his/her notebook when the teacher send the list with the suggestions. This latter chart allows teacher to discover the most diligent or advanced students that had included the words even before the teacher suggested them. Vocabulary Notebook has spread considerably fast in the last months internationally. Since the mobile applications were launched in March 2013, more than 13 000 users have downloaded them in many different cities around the globe. Moreover, teachers from different english schools worldwide are already encouraging their students to replace their old paper notebooks with this tool, including Vocabulary Notebook in their programs as a key tool for vocabulary learning. Some of this institutions are the University of La Laguna in Spain, the Polytechnical Institute of Leiria in Portugal and the Clark High School in Texas. Vocabulary Notebook has also received several awards and prizes, such as one of the Entrepreneurial Awards of “Fundación Fyde Cajacanarias – La Caixa” in 2012; being one of the 8 finalist projects in the IV Investment Forum “Tenerife Invierte” in March 2013 or the Second Prize “Tenerife Innova” in August 2013, awarded to the most innovative companies in Tenerife. 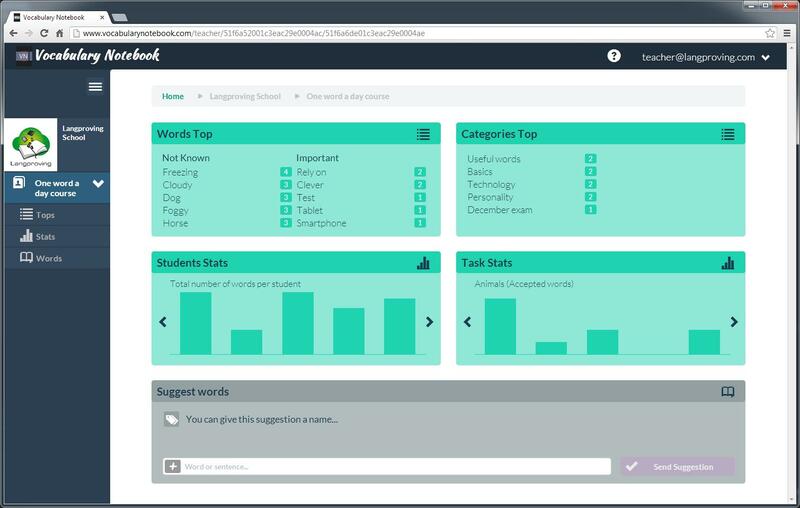 So, in short, Vocabulary Notebook is a full tech platform that helps student improve their vocabulary acquisition considerably by solving paper-related problems and offering powerful filters, sorting tools and self-assessment tests. It also allows them to use any technological device to access their notebook, anywhere at any time. Moreover, Vocabulary Notebook also provides very useful feedback features for teachers that help them guide their classes and also detect students needs easily, thus focusing on the real problems of students.